Before we proceed with how dependency injection works in Spring lets see what dependency injection actually is and why is it so important. Consider a simple example. Lets say we are designing a Cricket game. How will it's class look like? You will have a Cricket class that will probably have Bat class and Ball class. It is tightly coupled. If you device to change your Bat or Ball you have to write a new Cricket instance. It will also be very difficult to test. There can be any type of Bat or Ball and each test your need new Cricket instance. This is where dependency injection comes into picture. Now consider your cricket class as follows. If you notice you can create and use any type of bat and ball and play cricket with it. All of it is done at runtime. So essentially you are injecting Bat and Ball dependencies into your Cricket object. Code is now decoupled. You can use any Bat and Ball to play cricket. Testing has also becomes very easy as you can now mock your Bat and Ball objects and test your cricket. "Dependency injection is basically providing the objects that an object needs (its dependencies) instead of having it construct them itself. It's a very useful technique for testing, since it allows dependencies to be mocked or stubbed out." That's the dependency injection in general. Now lets come to Spring dependency injection. In Spring dependency injection Spring container instantiates and injects dependencies in your instance (also called beans) based on the dependency type or name (more on this later) rather that you instantiating and injecting it yourself. Lets see how spring DI works in case of our above code. Also note p namespace does not have any schema reference. Instead of explicitly providing dependencies to be injected you can autowire them. One simple example is autowiring by type. In this case Spring container will look for bean of dependency type among all beans and inject it. However note if more than one type of such bean exist this will fail. autowire is an attribute in bean tag with following possible values. NOTE : Dependency injection and IoC (Inversion of control) are words used interchangeably. Both mean dependencies are injected rather that created itself by the object which needs the dependencies. In this post we will see how python functions can be executed in a new thread and also how can we return some value from it. NOTE : Python is pass by value similar to java. But for objects it is pass by value of the reference (again just like Java). Explanation : We are have a simple function threadtarget that accepts a list in it's argument and adds a String called "Hello World!" to it. In our script we are creating a new thread to run the method threadtarget and finally read the value of list we pass to confirm value added by thread to the list is retained. In last couple of posts we saw how python works and how can we add a shutdown hook in python. 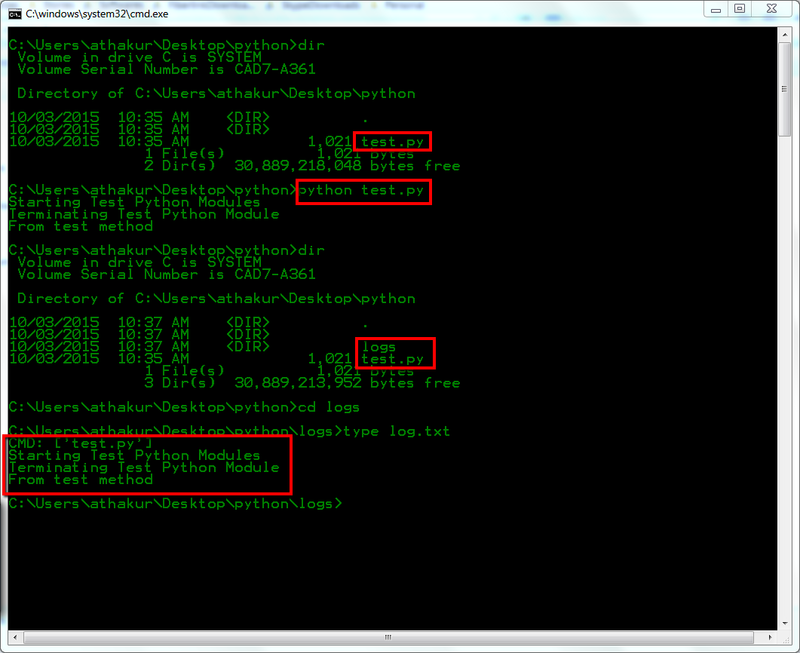 Whenever we execute any python script it's output gets logged to the console from which you execute your script. In this post we will see how can we log this output to a file while retaining what gets printed on your console. You should see a directory called logs getting created in current directory and it will have a file called log.txt with your script output. All of this is captured in below screenshot. Since I have covered some of python topics already I thought it would be a nice time to understand how Python actually worked. There is s common misconception that python is a purely interpreted language. We will see how it actually works now. 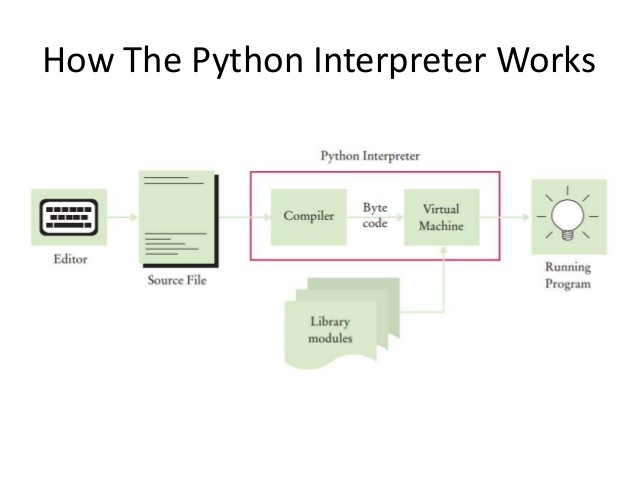 Python like Java is first compiled into byte codes which is the interpreted by Python VM by running an interpreter. When a module is imported for the first time, or when the source is more recent than the current compiled file, a .pyc file containing the compiled code will usually be created in the same directory as the .py file. When you run the program next time, Python uses this file to skip the compilation step. Running a script is not considered an import and no .pyc will be created. For example, if you have a script file abc.py that imports another module xyz.py, when you run abc, xyz.pyc will be created since xyz is imported, but no abc.pyc file will be created since abc.py isn’t being imported. As I mentioned before the imported modules are automatically compiled for further use. Lets see how that works out. testlib.py has a method called helloworld which simply prints "Hello World!" to the console. Note : Only difference is imported modules are compiled to pyc files automatically based on timestamps where as your source files are compiled on the fly. 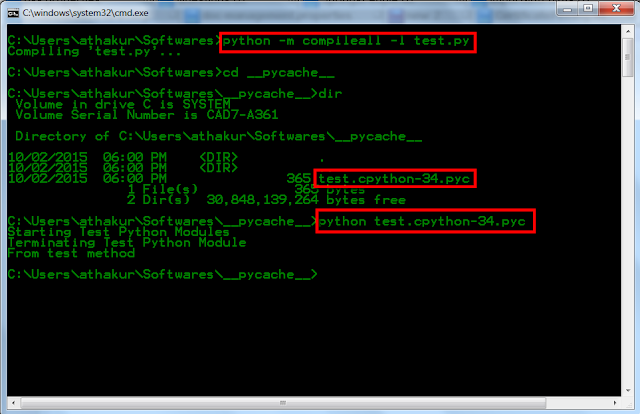 To compile your source files you can use compileall module. Compiled files with bytecodes are faster to run by python interpreter. Generally .pyc files are the once you ship. Note : " It's worth noting that while running a compiled script has a faster startup time (as it doesn't need to be compiled), it doesn't run any faster. " Given above note will help you understand why modules are compiled and not the main source file. Byte compiled modules simply help in faster startup time. A shutdown hook is basically a code snippet that allows programmers to run some code at program termination. I had discussed shutdown hook in Java some time back. In this post we will see shutdown hooks in python. 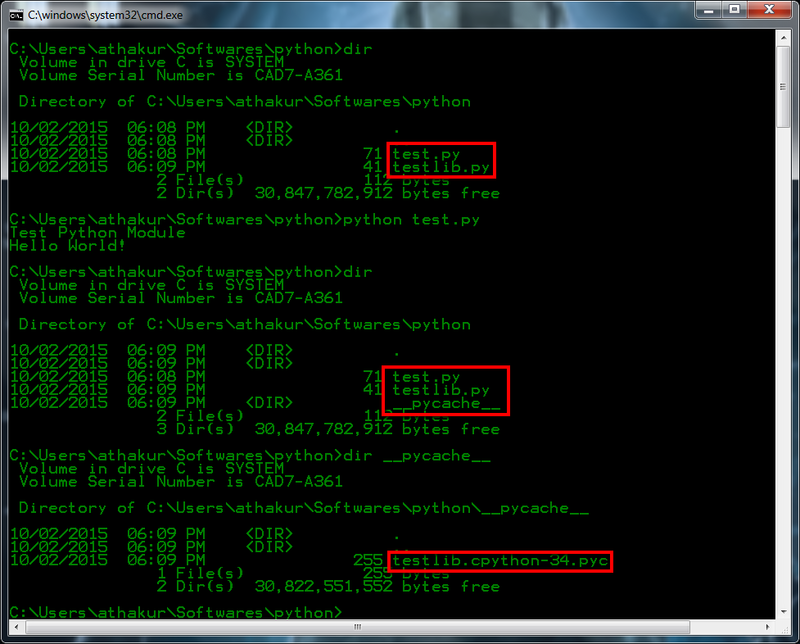 As you can notice it prints "From test method" at the end by executing registered method testmethod. Previously you could do the same by importing sys module and then using sys.exitfunc = testmethod but sys.exitfunc is deprecated since python 2.4 and is removed since python 3.0. The atexit module defines a single function to register cleanup functions. Functions thus registered are automatically executed upon normal interpreter termination. atexit runs these functions in the reverse order in which they were registered; if you register A, B, and C, at interpreter termination time they will be run in the order C, B, A. The functions registered via this module are not called when the program is killed by a signal not handled by Python, when a Python fatal internal error is detected, or when os._exit() is called.